Ted N. C. Wilson, PhD, is president of the Seventh-day Adventist Church General Conference, Silver Spring, Maryland, United States. Graham’s work took him to an estimated 185 countries and territories, but he was always delighted to return home to the mountains of North Carolina to be with his five children and Ruth, his wife of more than 63 years. In addition to Billy Graham’s live evangelistic events, television and radio broadcasts, a regular newspaper column, and a magazine, he managed to write 33 books, including his 1953 best seller, Peace With God, of which more than two million copies sold. But Billy Graham represented much more than statistics. Throughout his life, Pastor Graham proclaimed Christ’s salvation and righteousness. Transcending borders —cultural, national, sociological—his all-inclusive preaching knew no barriers of any kind. He included all people in his preaching, lifting up Christ and His Word with the outpouring of his sincerity and passion for truth, accompanied by his genuine desire to have all saved through the grace of Christ. Billy Graham articulated his life goal clearly and forthrightly: “My one purpose in life is to help people find a personal relation-ship with God, which, I believe, comes through knowing Christ.” He worked for God with a tremendous zeal and held His banner high, encouraging everyone to take hold of it with him. His preaching exemplified an honesty and openness befitting someone extolling God’s truths to the world. He did many things that promoted a positive identity for Christianity and made every effort to uphold and live by the standards of Christ, according to his understanding of biblical truth. As Seventh-day Adventists, what an example we have in declaring the fullest truth provided to human beings. 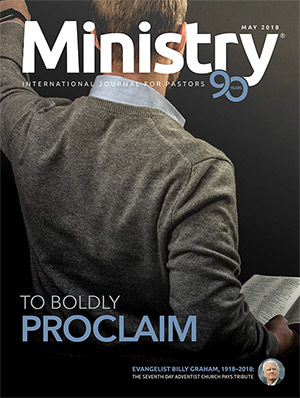 May we proclaim with complete focus and enthusiasm the urgent messages in the Scriptures, lifting up Christ, His Word, His righteousness, His sanctuary service, His saving power in the great controversy, His three angels’ messages, His health message, His last-day mission to the world—including the need to plead for the latter rain of the Holy Spirit—and Christ’s soon second coming. Billy Graham’s example of courage and grace is a reminder to all of us to live up to all the truth we know from the Holy Word of God and proclaim God’s eternal truth. * Factual information found in “Billy Graham: Profile,” Billy Graham Evangelistic Association, https:// billygraham.org/about/biographies/billy-graham and https://factsandtrends.net/2018/02/21/billy -grahams-life-ministry-by-the-numbers/.